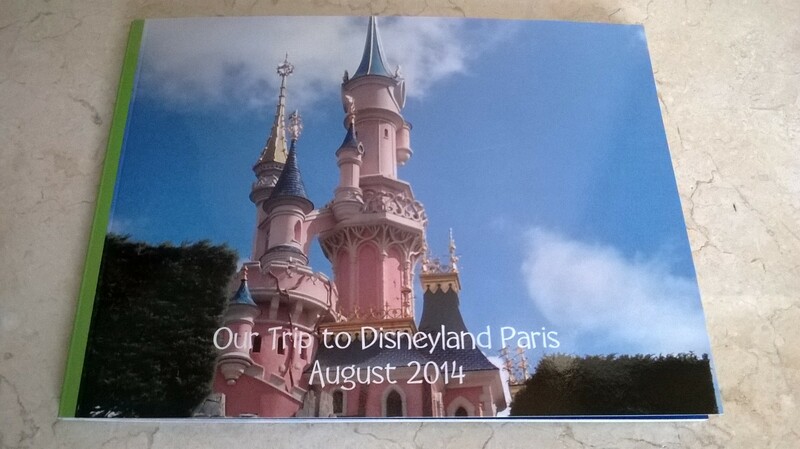 Yesterday the photo album of our Disney holiday arrived in the post. Normally I create an annual photo book using all our digital images, but having taken so many photos and in recognition of the very special holiday it was, I felt Disney merited a book of its own, likewise a review and some personal reminders on this blog. It has taken me a long time to visit Disneyland Paris. Twenty years ago when it opened, I was on my placement year working near Paris. However the art galleries, tourist attractions and night life of the capital were more appealing to me than Disneyland and I never visited the new park. At the time there was a feeling of indifference to the attraction in France and as I tried to embrace the life of a Francophile, I focused on more French pastimes. Fast forward twenty years and some of my preconceptions about Disney were slowly dissipating. Since having the children I have warmed to Disney as a brand I can trust and I also wanted to believe that Disneyland would be a magical experience for the children and a very special trip they would always love and remember. My feelings for Disney improved as the holiday approached and lovely, little details emerged. For example when our tickets arrived, the luggage labels were lovely and practical, hard wearing plastic coated labels of Disney characters. Little Miss got to be Cinderella, Little Man, Buzz Lightyear and Daddy and I Mickey and Minnie Mouse. The excitement built at the train station, Ashford International where Mickey does the train announcements for the Disney Express, by the time I got on the train I was genuinely excited. One of the benefits of staying in a Disneyland hotel is that your luggage is delivered directly to the hotel so we were in the park minutes after arriving at the TGV station. I genuinely had butterflies in my tummy as we walked through the entrance, down Maine Street and I got my first sight of Sleeping Beauty’s castle. Its beauty is breath taking and it is emotional to see it for the first time, I did blink away happy tears. Its not just a castle its a symbol of something bigger, its the image you have seen so many times when watching a Disney film, something you associate with dreams and magic. The castle was so beautiful, the sun glistened on the gold turrets in the day and it was truly mesmerising in the evening all lit up. We stayed at the Sequoia Lodge hotel. The rooms were clean, large and perfect for our needs with a beautiful view of the lake. We enjoyed the Lodge’s facilities, the swimming pool and restaurants were excellent. The half board option was brilliant, we were able to use our vouchers in other restaurants in the park and village and we also received a daily afternoon snack token. On our final night, we were booked into Café Mickey and it was an amazing experience. We met Mickey, Minnie, Tigger, Pluto and Goofy. The characters were fantastic with the children lots of photos and high 5s. Little Man amused us all as he hid under the table when Minnie arrived, his explanation was that he doesn’t like girls! We had done our research prior to the holiday and realised that as we were going at the busiest time of year, we needed to be organised. This meant we used the 8am early opening every morning. It was the best time of the day and we got to ride on our favourite rides many, many times! We also made use of the Fast Pass so queuing was not the issue we had feared. The iPhone app with waiting times was also a big help when we were looking for ideas and areas to head to. We tended to stay at the park until early afternoon and then return to the hotel for a swim, rest and change of clothes before returning for the evening. The rides were excellent, we did all the possible rides for our height. We all had different favourites, Buzz and Star Wars were the main attractions for Little Man, whilst Little Miss loved the Carousel and surprisingly the Phantom House. We returned to Pirates of the Caribbean several times for Daddy, but for me Peter Pan was so beautiful and simple that it was my firm favourite. The surprising aspect of the rides was that it was not about amazing effects, state of the art trickery but simple ideas beautifully executed. The children loved Autopia, which simply was 1950s cars they could drive. I also greatly admired the grounds, so exquisitely presented. My over riding impression is the level of detail and care in the park, at Disney it seems that every little detail counts. I have never been to an attraction so clean and tidy. Detail is everywhere, the beautiful shop windows, the Queen peeping out of the window by Snow White’s ride, there are so many tiny details everywhere you need to do the rides many times to notice everything. The Disney parade was magical and the reaction of our little ones so heart warming and delightful. Our daughter’s reaction to seeing the Frozen princesses Ana and Elsa on their float was perfect, such delight and disbelief, more happy tears behind my sunglasses! For Little Man the highlight was the Toy Story float, although I think having his photo taken with Buzz the next day may have topped the parade. He just couldn’t take his eyes off his hero and cuddled and high fived him with such joy. It is these moments which will live with me forever, being able to give our children such happy and joyful times give us indescribable pleasure and delight. Whilst we did spend more time in the park, we also visited the Disney studios, with Cars and Toy Story rides it was hugely popular with Little Man. Personally I liked the shows here, I thought Animagique, Cinemagique and the Cars stunt show were very cleverly done. I did find the studio much busier than the park, but the new ride Ratatouille had just opened and was very much in demand. Again great planning here meant I queued for 5 minutes for Fast Pass and then we just had a 5 minute queue for the ride when we returned at our allotted time. At this time the queue for the ride was more than 2 hours. Given such demand, the expectations of the ride were high and again Disney did not disappoint, its a multi sensory ride which you ride wearing 3d glasses. I have no idea how it is done, but it is very special, innovative and creative. Disney was an amazing holiday, it was everything I wished for and more, it softened me and made me just a little more sparkly and joyful. I loved the way our family relaxed, smiled and shared such magical experiences, such a special and precious holiday.